This is all part of the swamp’s investigation of Trump colluding with the Russians. It turns out now that the professor that Papadopoulos was supposedly talking to that had all this dope on the Russians has disappeared. The man at the heart of the Clinton dirt claim has disappeared. Professor Joseph Mifsud, one of the main subjects in the FBI affidavit against Donald Trump’s ex-foreign policy adviser, Papadopoulos, has disappeared. This is the guy who told Papadopoulos the Russians had a lot of dirt on Hillary and later denied that he had told Papadopoulos this. You know, this is one of these ancillary little tributaries off of the Mueller investigation. And now this guy who had all the goods supposedly can’t be found. In no corner of the world do they know where he is. Professor Joseph Mifsud. So he first denied it. Now he can’t be found. Nic Robertson, CNN, has the story. Our all-time favorite CNN reporter. Nic’s on the case trying to find the guy and will no doubt ask him what he thinks of Obama when he does, or if he does. But it’s another thing falling flat, just totally falling apart on these people. 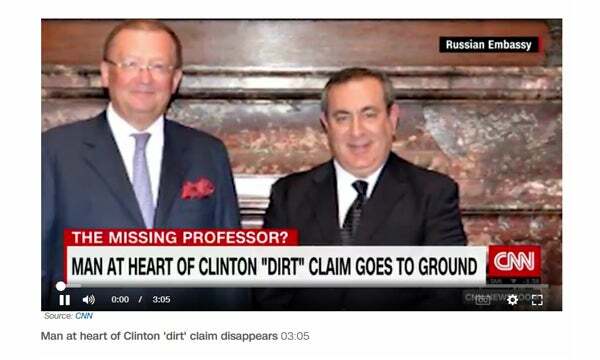 “Yeah, I got dirt, I got dirt, I got dirt, this guy, this guy wanted to talk to Trump about Hillary, got dirt on it, the Russians know all about it.” Now he can’t be found. So he’s either dead or he’s in prison or he has fled. One way or another, this guy, Mifsud, wants nothing to do with this, or somebody doesn’t want Mifsud to have anything to do with this. He’s gone. But with CNN on the case, they don’t even have to find him to say they have. It’s CNN.